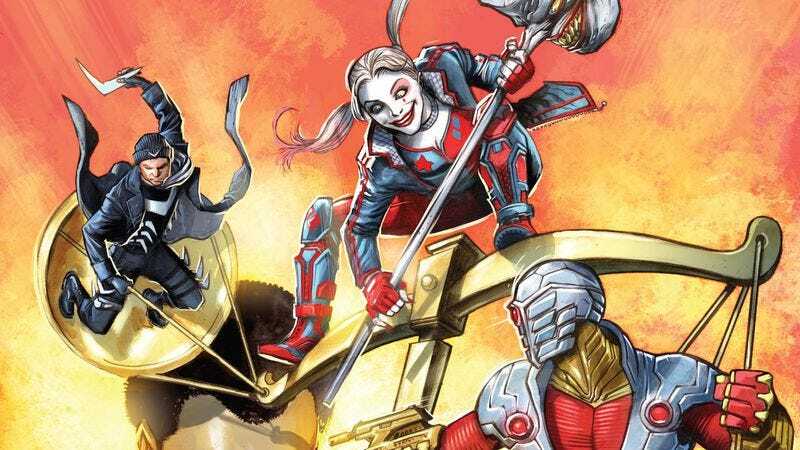 Writer John Ostrander’s Suicide Squad is one of the classic runs in superhero comics, and with the Squad getting a huge push from the immensely popular Suicide Squad movie, DC is bringing the creator most heavily associated with the team back for a new miniseries. This preview of next week’s Suicide Squad: War Crimes #1 shows why Ostrander is such a great fit for this concept: he tells stories rooted in political conflict, has a great ear for team banter, and his big imagination allows him to create compelling new characters while finding fresh angles for old villains. The opening sequence is a tense, thrilling introduction to Strikeforce Europa, and the subsequent mission briefing from Amanda Waller injects some humor into the proceedings as she prepares the Squad to rescue the former Secretary of Defense. The art team of Gus Vasquez, Carlos Rodriguez, and colorist Gabe Eltaeb does strong work bringing intensity to Secretary Carmody’s abduction, and the dynamic action quickly establishes how dangerous Strikeforce Europa can be. The tone of the visuals changes significantly when the story jumps to the Squad, with a brighter palette to reflect the chummy atmosphere within the room, and the facial expressions and body language highlight the comedy in Ostrander’s script. Fans of the Suicide Squad have quite a few options for titles in DC Rebirth, but if they want to discover why the Squad became a major force in the DC Universe to begin with, they should seek out War Crimes #1 when it hits stands next Wednesday.